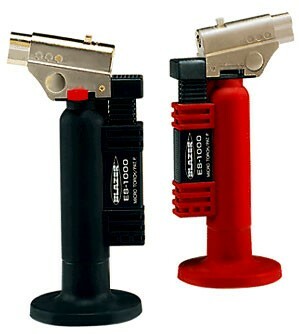 Featuring a unique angled head design the ES-1000 is a slim yet powerful Micro Torch. 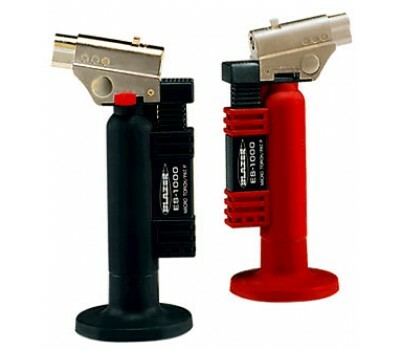 Flame adjustment allows precise control of flame length, burning from a powerful blue torch to standard yellow flame. This completely portable, self contained unit will meet all your soldering brazing and other professional needs. Available in a choice of Black or red. Top mounted switch allows for a quick flame change, from 2500ºF butane blue to a standard yellow flame. Slim design allows it to fit almost anywhere. Dental and Medical Lab work, Jewelry/lapidary work, electronic repair and other professional repair jobs.